We’re at midcourt, and the ball is about to go up…it’s Monday Tip-Off! Start your week here at the NLSC with a feature that’s dedicated to opinions, commentary, and other fun stuff related to NBA Live, NBA 2K, and other basketball video games. This week, I’m tipping things off with some experiments in NBA 2K19’s MyCAREER, and the discoveries about the mode that they’ve yielded. Once again, despite my belief that I was over the career experience on the virtual hardwood, I’ve ended up playing MyCAREER extensively in NBA 2K19. It’s been a fun and rewarding experience this year, and I’ve enjoyed grinding my way up to 90 Overall without buying any VC, completing the first season and bringing another virtual championship to Chicago, and more recently, hitting 92 Overall and maxing out all my Badges. The online experience hasn’t been stellar this year, but I can say that I’ve enjoyed much of what the single player portion of MyCAREER has to offer. Spending so much time with MyCAREER has piqued my interest in finding out more about the mode. In addition to the observations I’ve made over the course of playing my main game, I’ve also run a few experiments with additional saves. I’ve wondered whether certain events are scripted and consistent, if there’s a game over should you play or sim long enough, the mechanics of the Daily Prize Wheel, and even the speed of the bikes. Through those experiments, and a thorough playthrough of the mode, I’ve compiled some information about MyCAREER that I hope will be both helpful and interesting to gamers who may have similar questions about all of its ins and outs. We’re at midcourt, and the ball is about to go up…it’s Monday Tip-Off! Start your week here at the NLSC with a feature that’s dedicated to opinions, commentary, and other fun stuff related to NBA Live, NBA 2K, and other basketball video games. This week, I’m tipping things off with a few thoughts on how future NBA 2K games could craft a better MyCAREER story. As much as I’ve criticised the approach, I am somewhat fascinated by the concept of the MyCAREER story. It’s been done rather badly in a couple of games, be it the way it’s affected the gameplay experience, the narrative, or both. As such, it would be nice to have the option of a straightforward career mode. At the same time, a lot of effort has gone into the approach over the years, and it’s paid off with a couple of rather good and enjoyable tales. Since the concept doesn’t seem to be going anywhere, it’s vital that Visual Concepts does the best job possible with it. 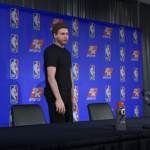 When it comes to the MyCAREER story approach – in particular, the times it hasn’t been done well – there have been a few common drawbacks since its debut in NBA 2K14. Ill-fitting back stories and unlikeable personalities for the player character, annoying NPCs and cringe-worthy cutscenes, a lack of story branching, meaningless decisions, and general intrusiveness, are among the most prominent issues. The good news is that these problems can be remedied, and if backed by a well-written narrative with characters that aren’t annoying in a bad way, a story can enhance MyCAREER. To that end, this is how I’d like to see the MyCAREER story crafted in future games. We’re at midcourt, and the ball is about to go up…it’s Monday Tip-Off! Start your week here at the NLSC with a feature that’s dedicated to opinions, commentary, and other fun stuff related to NBA Live, NBA 2K, and other basketball video games. This week, I’m tipping things off with a comparison of my experiences with face scans in NBA Live 19 and NBA 2K19. Hey, do you think by using the words “Two Face” in the title of this week’s Tip-Off, I’ll draw a few hits from people Googling the iconic Batman villain? Probably not, but if for some reason that is how you got here, I’m afraid I’m going to have to disappoint you. Likewise, if you’re looking for articles about the colloquialism “two-faced” or a certain psychological concept, you’ve hit upon the wrong article. Of course, if you do happen to enjoy basketball video games, then I certainly invite you to stick around and take in our content! With that being said, basketball gaming is, as always, the topic of the day. 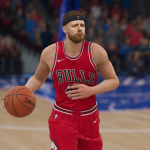 On this occasion, I’m talking about my different experiences performing face scans in NBA Live 19 and NBA 2K19. While it is my intention to dial back my involvement with the career modes this year, I was always going to check them out. Since the option is available, I also tried to scan my face in for both my One Player and MyPLAYER. There were moments of frustration attempting both face scans, but one game yielded far better results than the other. Without any further musing about drawing in a few unsuspecting people via the SEO, I present a Tale of Two Face Scans. It seems that a few people already have their hands on the full version of NBA 2K19, but for most of us, we’ve still got a short wait. The 20th Anniversary Edition will be out on September 7th while the Standard Edition drops next week on the 11th, but in the meantime, we’ve been able to get a taste of this year’s game from Visual Concepts via NBA 2K19 The Prelude. I’ve already shared some impressions of The Prelude in Episode #261 of the NLSC Podcast, but for those who prefer text to audio content, I thought that I’d offer a write-up as I did for the NBA Live 19 demo. As in previous years, the latest version of The Prelude is exclusive to the PlayStation 4 and Xbox One. It offers a chance for us to make a head start on MyCAREER by creating a player and playing through the preliminary stages of the mode, as well as sample some 5v5 gameplay through a ten minute game in 2KU. To that end, it’s a very brief glimpse of what’s on offer in NBA 2K19, but it’s enough to give us some insight into what to expect in terms of MyPLAYER Archetypes, the tone of the story, and the gameplay in general. Read on for my impressions! Episode #261 of the NLSC Podcast is out now! Join Arcane and I for a discussion of the latest news heading into the final stretch before the release of NBA Live 19 and NBA 2K19, including our impressions of NBA 2K19 The Prelude. The official NBA Live website has released some snippets about Ultimate Team in NBA Live 19. It seems as though packs will feature a lot more transparency this year. Xbox One Gamers have been getting their hands on a trial of the full version of NBA Live 19 via EA Access. We discuss some of the details and impressions that have been shared with the community. Once again, we reiterate our desire to see more focus on NBA content in NBA Live moving forward, and our hopes for the future in that regard. 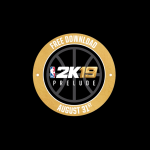 NBA 2K19 The Prelude is out, along with the MyNBA2K19 app. 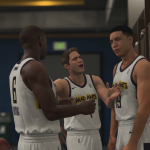 We give our impressions on this year’s sneak peek of NBA 2K19, from face scanning to the MyCAREER story and gameplay. We react to the NBA 2K19 Neighborhood trailer, as well as other info on NBA 2K19’s iteration of the MyCAREER game world/hub. Episode #261 of the NLSC Podcast wraps up with our thoughts on Manu Ginobili’s retirement, and his impressive NBA career. As we mentioned in this week’s episode, our heartfelt condolences go out to the families of Elijah Clayton and Taylor Robertson, and all those affected by the tragic shooting at a Madden event in Jacksonville, Florida last week. If you would like to contribute to the Jacksonville Tribute Fund that EA has helped spearhead, please see here for more information. NBA 2K19 The Prelude is now available on PlayStation 4 and Xbox One! As in previous years, this early hands-on look at NBA 2K19 allows us to get a head start on MyCAREER, as well as a feel for this year’s game. It weighs in at around 17 GB on each console; find it in the PlayStation Store here, and the Xbox Live Marketplace here. The recently released MyNBA2K19 companion app can be used to scan your face for use in The Prelude and the full version of NBA 2K19. Please note that you won’t be able to log into your console account via the app until you’ve fired up The Prelude or the retail game. Also note that while the PC version will support face scanning via MyNBA2K19, The Prelude is exclusive to PlayStation 4 and Xbox One. As always, feel free to share your impressions in the comments section below. You can also join in the conversation here in the NBA 2K19 section of the NLSC Forum. In the wake of releasing “The Way Back” trailer for NBA 2K19’s MyCAREER, 2K Sports has revealed additional information on this year’s mode and story. It will apparently be possible to skip cutscenes this year, as well as the entire Prelude in subsequent playthroughs. You can skip cut scenes in #NBA2K19 and in your second and subsequent careers, you can skip the entire Prelude. This comes as very welcome news, as many gamers have expressed a preference for a more streamlined MyCAREER experience without lengthy cutscenes. The ability to skip The Prelude entirely in subsequent MyCAREER games should also make the prospect of creating second players or starting over from scratch far less arduous. While these could be described as overdue additions to the mode, it’s great that community feedback has been heeded in this regard. As always, feel free to share your thoughts in the comments section below, as well as here in the NLSC Forum! 2K Sports has dropped the official trailer for MyCAREER in NBA 2K19. Titled “The Way Back”, the trailer provides us with a glimpse of this year’s story, as well as some of the actors who will be playing key characters. 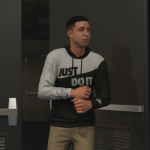 From the looks of things, this year’s MyPLAYER character – referred to in cutscenes as “AI” – ends up playing in China after being drafted. The story then appears to revolve around efforts to make it back to the United States and the NBA, including a stint in the G-League. These efforts to finally make it in the NBA appear to tie in with the “They Will Know Your Name” tagline that was revealed in early previews. Exact details about the story and features of the mode are yet to be revealed, but should no doubt be coming soon in a detailed developer blog. Actors that will be playing roles in this year’s MyCAREER include Anthony Mackie, Haley Joel Osment, Michael Rapaport, Aldis Hodge, Rob Huebel, Blake Jenner, Ricky Whittle, Mo McRae, and Ginger Gonzaga. Check out the trailer below! PlayStation 4 and Xbox One gamers will be able to begin playing through the early stages of MyCAREER with this year’s Prelude, which comes out August 31st. What are your thoughts? Have your say in the comments section below, and join in the discussion here in the NBA 2K19 section of the NLSC Forum. 2K Sports has officially revealed LeBron James as the cover player for the 20th Anniversary Edition of NBA 2K19. A couple of teaser images hinted at a forthcoming announcement, while promotional materials seen at GameStop let the cat out of the bag in regards to LeBron gracing the cover. As noted yesterday, this is his second NBA 2K cover following NBA 2K14. The game is already available to pre-order, and the pre-order bonuses have also been revealed. There will apparently be only two editions this year: the Standard Edition, and the aforementioned 20th Anniversary Edition. The Standard Edition retails at $59.99 USD, and will be released on September 11th, 2018. The 20th Anniversary Edition, which offers more pre-order bonuses including some physical collectables, retails for $99.99 USD and comes out September 7th. 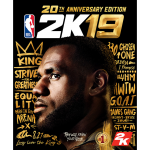 At this time, it appears that pre-ordering the 20th Anniversary Edition will be the only way to play NBA 2K19 four days early, in contrast to the Early Tip-Off Weekend promotion across all editions in years past. A trailer has been released to celebrate the announcement. It features clips of LeBron James in previous NBA 2K games, though not surprisingly, doesn’t feature any NBA 2K19 footage. The trailer is accompanied by the song “How Could They Have Known?” featuring 2 Chainz, Rapsody, and Jerreau, tying into the game’s tagline of “They Will Know Your Name”. Check out the trailer here, or watch it below. Additionally, The Prelude has been confirmed for release on August 31st. 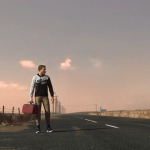 As in previous years, it will allow gamers to get a head start on MyCAREER. The Prelude will once again only be available for PlayStation 4 and Xbox One gamers, meaning PC and Switch gamers will have to wait until the game drops to jump into the mode. Speaking of MyCAREER, pre-order information also confirms that The Neighborhood will return in NBA 2K19. Please see below for the full cover art for the 20th Anniversary Edition – which notably features LeBron James in a generic black jersey – and a list of all the pre-order bonuses. The cover player and artwork for the Standard Edition of NBA 2K19 will be revealed at a later date, with a placeholder image currently being used on the pre-order page. We’ll post more information as it becomes available, but in the meantime feel free to add your thoughts in the comments section below, as well as join in the discussion here in the NLSC Forum. Episode #221 of the NLSC Podcast is out now! We’re in the final countdown to the release of this year’s games from EA Sports and 2K Sports, and Arcane and I have plenty to talk about with a big update to the NBA Live 18 Demo, as well as the release of The Prelude to NBA 2K18. The NBA Live 18 Demo has received another update. On top of making some further gameplay tweaks, it also added updated rosters, and two additional teams to Play Now: the Boston Celtics and Houston Rockets. EA Access subscribers on Xbox One are currently enjoying a ten hour trial of the full version of NBA Live 18. Their streams and impressions suggest further improvement over the demo, which is great news. A Game Informer article provided us with a few details on this year’s MyCAREER story ahead of the release of The Prelude, and some further information about The Neighborhood. In the wake of a somewhat flat trailer, The Prelude has been released, along with the MyNBA2K18 companion app. We tip off our impressions with a few thoughts on face scanning. We’re not impressed by the lack of customisation options, nor the decision to put more content behind a VC paywall. It’s a continuation of a disheartening trend that began in NBA 2K17. The story in this year’s MyCAREER mode leaves something to be desired. Although we like the general idea of being able to pick our team, the plot, acting, and characters are rather corny, with one character in particular being a bit uncomfortable. Although the brevity of The Prelude was disappointing, the gameplay was a highlight, and demonstrates some pleasing improvements that have us looking forward to the full version of NBA 2K18. We wrap up Episode #221 of the NLSC Podcast with Our Week in Basketball Gaming, which featured NLSC THRILLHO’s final 2K Pro-Am game for NBA 2K17, and the acquisition of a long-coveted MyPARK trophy. Have some thoughts on the latest episode? Sound off in the comments below, or here in the Forum. Also, if there’s a topic you’d like us to discuss on the next episode of the NLSC Podcast, feel free to hit us up in this thread. The Prelude to NBA 2K18 is out now worldwide on PlayStation 4 and Xbox One. As previously noted, the brief free to play preview of this year’s game from 2K Sports allows you to get a head start on MyCAREER. Similar to last year’s Prelude, it also includes 2KU, which features an interactive tutorial that teaches you the controls in a casual 5-on-5 setting. You’ll need to download The Prelude and fire it up before you can scan your face using the MyNBA2K18 app. Note that while you’ll be able to change your face and keep playing through 2KU, you can only play through the MyCAREER portion once. After that, you’ll need to wait until NBA 2K18 comes out next week in order to continue your career, or start over fresh. 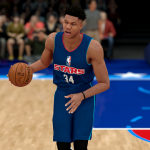 Feel free to share your impressions of The Prelude in the comments section below, as well as in this topic in the NBA 2K18 section of the NLSC Forum. If you’ve got a great face scan to share – or a humorous one, for that matter! – feel free to post it as well. We’ll be sharing our impressions in Episode #221 of the NLSC Podcast, which will be coming out over the weekend. 2K Sports have revealed the new cover art for NBA 2K18, featuring Kyrie Irving in a Boston Celtics jersey. Following the trade between the Celtics and Cleveland Cavaliers, 2K indicated that they would be issuing a new cover “at a later date”. While the digital cover art and icon for the game will be updated upon launch, physical copies won’t feature the new cover art until the initial stock is depleted. Although it isn’t unprecedented in sports games, cover players changing teams before the game is even released is a rare occurrence. Several players have been traded the year after appearing on the cover of a basketball video game, and Ray Allen was traded halfway through the 2003 season, during which he was the cover player for NBA ShootOut 2002. The ShootOut series also features the only other cover player for a basketball game to be traded before the game’s release, as the 2002 version featured Stephon Marbury in his New Jersey Nets uniform despite his offseason trade to the Phoenix Suns. 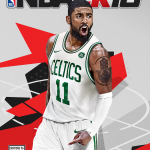 Similar to NBA 2K18, an updated cover was later issued. You can check out the full cover art below. We’re a week away from the release of NBA 2K18, but only a couple of hours away from the release of The Prelude! If you’re on PlayStation 4 or Xbox One and would like to get a head start on MyCAREER, be sure to check it out when it launches at 12:01 AM EST. The MyNBA2K18 app is also now available for Android and iOS devices, so pick it up to scan your face into the game, and earn extra VC through various mini-games. In less than 24 hours, we’ll be able to get our hands on The Prelude for NBA 2K18. 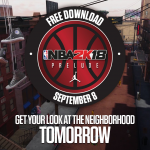 The free to play preview for NBA 2K18 will be available globally on PlayStation 4 and Xbox One, and will provide gamers with a head start on MyCAREER, as well as an early look at The Neighborhood. It will be released at 12:01 AM EST globally, so unlike the NBA Live 18 demo, you can’t snag it earlier by creating a New Zealand account. To hype up the release of The Prelude, 2K has dropped a new trailer. It emphasises the general concept of working your way up from the streets to the glamour of the NBA, and features clips of The Proving Ground, which will be integral to the beginning of this year’s MyCAREER story. Check out the trailer below, or catch it here on YouTube if you can’t see the embedded video. Additionally, the MyNBA2K18 companion app is now available for Android and iOS devices. In addition to being used to scan your face for The Prelude and NBA 2K18, it includes the familiar trading card game and other features that allow you to earn Virtual Currency. If you still have the MyNBA2K17 app installed, you may want to uninstall it before installing the MyNBA2K18 app, just to avoid any potential issues. Got any thoughts on the trailer? Feel free to share them in the comments section below, as well as join in the discussion about The Prelude and other NBA 2K18-related topics here in our Forum. It’s been a big week for NBA 2K18 news to say the least. Before we wrap up the weekend, there are a few more details to report in regards to this year’s MyCAREER story, and the new Neighborhood experience. Matt Bertz has posted a preview over on Game Informer discussing The Neighborhood and the MyCAREER story in NBA 2K18. Although there will be a narrative again this year, it will be a less linear experience. The basic plot is that your player, DJ, is a former blue chip prospect who abandoned his hoop dreams to pursue a career in music. Now eager to return to the hardwood, your character is trying to make the big time by participating in The Proving Ground, an amateur streetball event. The story begins with The Prelude, which will be released September 8th. The article also provides a breakdown of The Neighborhood, which as previously noted, encompasses the NBA through MyCAREER, 2K Pro-Am, and The Playground (the new version of MyPARK). Park affiliations have also been done away with, as all players will be hanging around in the same Neighborhood. Matt also confirms that the old upgrade system is back, and talks about the new MyPLAYER Archetypes. As you can see from this chart, the primary and secondary archetypes that you select will determine which Badges you can upgrade. Thanks to Dommy73 for the heads up on the chart. 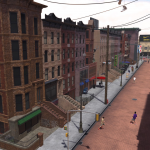 2K Sports has also Tweeted out a Guide to The Neighborhood. Locations include The Playground (as noted above, the new MyPARK), 2K Zone (mini-games and meet-ups), The Venue (live events), The Downtown Court (jumpshot game), Foot Locker Store (for shoes, obviously), and King of the Court (1-on-1 challenges). It also shows off some of the Road to 99 rewards, and the new phone messaging system. With The Prelude dropping this week, and the Early Tip-Off Weekend for NBA 2K18 beginning in less than two weeks, I’m sure there’ll be more news and previews right around the corner. In the meantime, feel free to share your thoughts on the latest details in the comments section below, as well as join in the discussion in our NBA 2K18 Forum. Episode #220 of the NLSC Podcast is out now! Arcane and I have plenty to talk about following a big week of NBA 2K18 news, as well as the release of a new patch for the NBA Live 18 demo. The question is, as always, now that the show has been recorded, will any further news break over the weekend? Patch 1.05 has been pushed through for the NBA Live 18 demo, and this time, we have a few patch notes. Once again, we take the opportunity to offer some further impressions of the demo, and encourage everyone to keep the feedback coming. Kobe Bryant and Kevin Garnett will be joining NBA 2K18’s broadcasting team as special guest commentators. Unfortunately for KG, the game is only rated E10+. The latest NBA 2K18 developer blogs by Scott O’Gallagher and Da_Czar have delivered a lot of promising news about improvements to AI, playcalling, and gameplay in general. NBA 2K18 will see the debut of The Neighborhood, a new online open world experience that encompasses MyCAREER, 2K Pro-Am, and MyPARK (now called The Playground). It’s very cool, but we do have a few questions and concerns. There will be 189 MyPLAYER Archetypes this year, with primary and secondary archetypes and hybrid styles. Excellent news, in our opinion. A list of Achievements for The Prelude has been leaked, hinting at this year’s story. Mild spoiler warning! We wrap up Episode #220 of the NLSC Podcast with Our Week in Basketball Gaming, which included a couple of really fun sessions of 2K Pro-Am as our season in NBA 2K17 continues to draw to a close.